Q: What is your story? Tell us something more about Hush? A: After my first experience with Morning that is a French neobank, I wanted to rethink and reinvent the mutualism banking model combined with a mobile and decentralized environment. –	Opening new perspectives to the inexperienced users about the crypto-currencies sector as well as enjoying an innovating mobile bank service using FIAT. 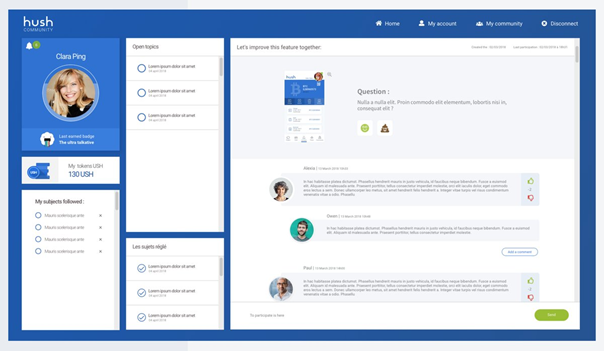 – An account project for users so that they can finance and realize their project and fix objectives for themselves. Q: What is your ICO strategy? A: We have decided to be focused on the quality of our project with an experimented team in this area and well-known partnerships in order to manage a reasonable ICO with a hardcap of 10M€. The PreICO will be over the next March 16, 2018 and the public ICO will be launched in few weeks after some announcements concerning the project, particularly for the opening of the platform Hush community. This platform will be reserved to the holders of token USH to participate to the project’s development. In another hand, we are working with well known partnerships as well as Deloitte for the definition of our token USH and Generali Concierge Services that will be be our collaborator for our private offer “Hush life”. A: We can see that the regulators affect the future of cryptocurrencies. The prices of each cryptocurrencies are directly impacted by the statements of each regulators. For our part, we want to include cryptocurrencies in daily usage thanks to our crypto-wallet lean back on an IBAN account. Therefore, we are less impacted to the volatility of prices. The most important for us is the massive use of cryptocurrencies even if these two aspects are linked. Q: How would you convince the reader to start using Hush? A: We are going to offer a banking mobile experience with the traditional uses which are still necessary, as the IBAN account, the payment card, insurances and ways to save money for projects. Accordingly, the user could use as well as its FIAT and cryptocurrencies for an optimale experience. Then, users will have an access to exclusives services, “Hush Life” supported by Generali Concierge Services. With this offer, users could, at anytime by chat, reserve flights, buy tickets for events, order a babysitter, etc. All services that users may require will be included in the Hush’s app. 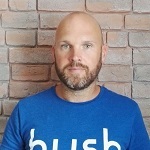 Finally, holders of tokens USH could participate to the project through the platform Hush Community (https://hush.community/?lang=en) to develop the application of Hush. Our ambition is not to be a major actor but to be an exclusive and premium neo-bank. Q: What is on the roadmap for Hush moving forward? A: The experience of the team allow us to control the roadmap with the upcoming banking licence application, the opening in March of the Hush Community platform and the launch of the application at the end of 2018. 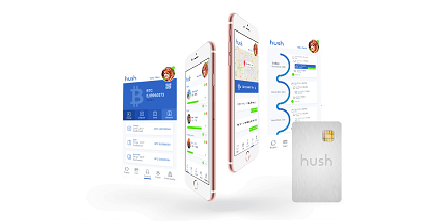 For the first year, Hush offer will be available through a sponsor program and limited to 25.000 accounts for the Europe area. Contributors to the ICO are obviously priorities to obtain the offer. We are confident for the implementation of our project.